Graham Arader: Old Canfordian Event - April 9th! Old Canfordian Event - April 9th! I do hope that you received our Save the Date email in January, letting you know of an upcoming Canford event in New York. 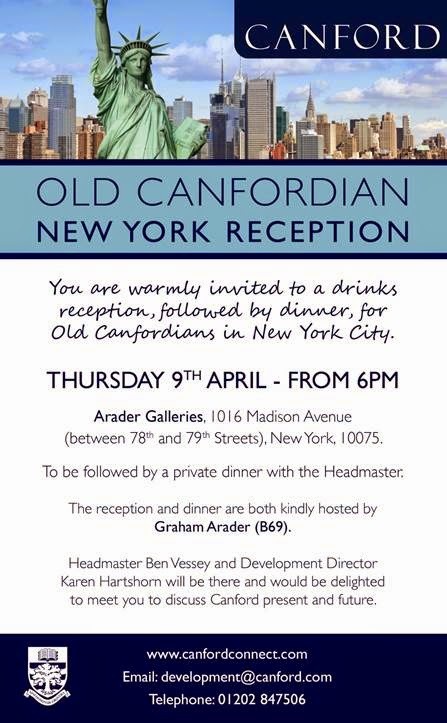 I am delighted now to be able to send you this invitation to drinks and dinner with the Headmaster of Canford, Ben Vessey on Thursday 9th April 2015. We are very grateful to OC Graham Arader (B69) for so kindly hosting the drinks reception and the dinner. We very much hope that you will be able to attend and would ask that you RSVP by Friday 27th March 2015. If you have any questions regarding this event, please do not hesitate to contact me.